How, Oh How Can We Be New? Dan and I spent two hours Tuesday morning walking around our Pennsauken neighborhood hanging flyers on our neighbor’s door knobs. We wanted them to know that we’re trying to do something new by starting two new Sunday meetings, one at 10:30 a.m. and one at 7:00 p.m. Afterward I marked out the area we had covered on a map of our target are in the gathering room at 3800 Marlton Pike. 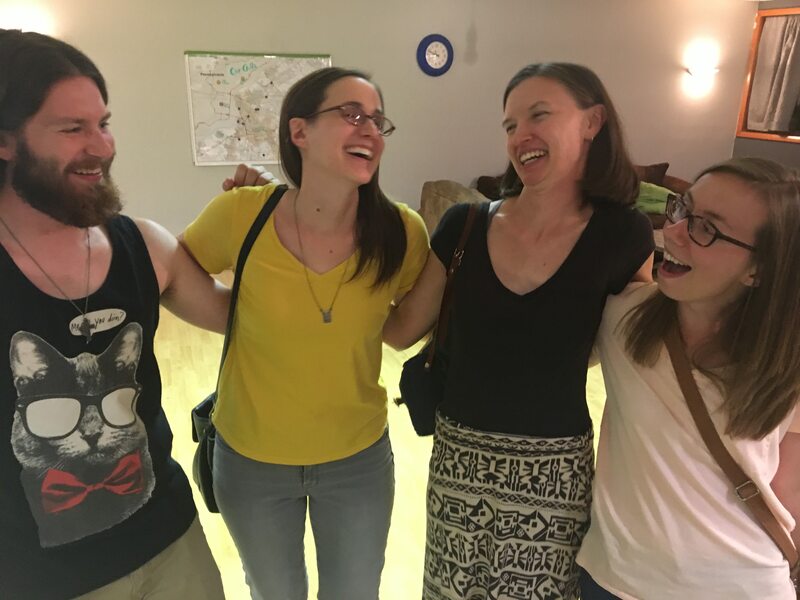 On that big map, the streets we canvassed in two hours were about the size of a dime. Phew! This is going to take a long time! It takes some work to be new. But every time I walk around the neighborhood I realize that we’re newer than we think. This week we met people who are new to the neighborhood who have never heard of us. 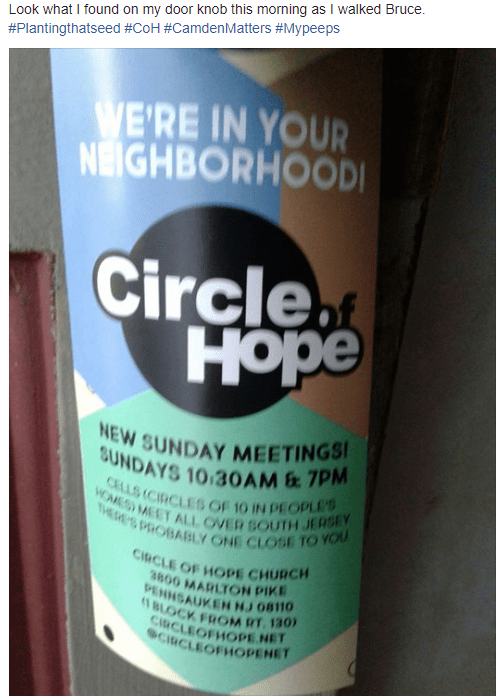 We also met people who grew up in the neighborhood but they were still new to the knowledge that “Oh Circle of Hope is a church?! That’s not a firehouse anymore? !” We’re newer than we thought even before we started two new meetings. The energy of the new meetings is a lot of fun. The teams that have gathered around them are the best part. On Sunday mornings we stand in a big circle at 10:00 a.m. and pray for all the people who might be on there way. Then we snap into action and we’re ready for them when they arrive. Many hands, light work… light work, good vibes. In the evening, the team turns our garage bays into a living room, moving almost every piece of thrift store furniture we have collected in the place. Folks that come for the first time are getting in on the action when it’s time to move it back. We’re making something together. It feels good. And the goodness is spreading. The cell leaders are getting in on the action by hanging the same flyers on door knobs in the neighborhoods where their cells meet. We’re spreading out across the region. Planting seeds, maybe in areas not bigger than dimes on our map, but so be it–the seeds are sown. We’re doing it together. That’s the whole point. Honestly, it’s not that grandiose. By doing something new I think we’re getting back to basics. It’s a lot simpler and, as a result, older. The church has been regular folks living life together for a long time. Our simple vision is an old vision. Acts 20:20 says that the disciples in the early church met “in public and from house to house.” That’s our Sunday meetings and cells. It doesn’t take much more than sincere participation in these simple gatherings to be a real Christian. The meetings need to happen because they need to be made. Christians are makers and we want to be good at making something with Jesus. Space needs to be made for the next person because we need to love them intentionally. Christians are lovers who love without exception. That’s it! Make something with love! Each person brings their gifts, their love and their mustard seed of faith that any of this matters and the miracle of the Church gets born every day. We’re new, yes. We’ve always been that way. Check out our facebook events for details of our Sunday Meeting After Party on September 10th and or come to our Family Dinner for More Than Just Family on September 3.